In the third pAsuram, AzhwAr says “emperumAn is the one who is having the many yugas starting with kruth yuga, and all the dhEvas (celestial beings), manushyas (human beings) et al who exist in those times, as his wealth”. Subsequently, AzhwAr says “Being great and yet being subservient towards your followers, and while remaining as all entities starting with time, you should mercifully explain your uniqueness of being unconnected with them”. viththagaththAy niRRi nI ivai enna vidamangaLE! 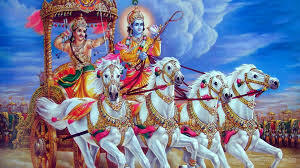 thiruchchakkaraththAy – similarly, oh one who is having the weapon, divine chakra, which can transform day into night! ivai enna vidamangaL – what kind of uniqueness is this? Oh one who can conduct your chariot in many ways and who is having the weapon, divine chakra, which can transform day into night! You should mercifully explain; your are being the controller of yugas which are having variations such as krutha, thrEthA, dhvApara and kali, and are distinguished to be incomparable with one another; you are being the time and having as your form, the innumerable chith (sentient) and achith (insentient) objects which are existing within the scope of such time, being the same in being the embodiment of knowledge, having distinguished aspects such as being self-illuminating, being knowledgeable etc and having distinguished natures as said in “EkO bahUnAm“; you are being the controller for their differences; yet, you remain amazing due to being unaffected by their defects as said in “namaksnigdhAni bhUthAni“; what kind of uniqueness is this? chiththirath thEr valavA – Oh one who can conduct the chariot in amazing ways! His amazing acts include – when dhrONa arranged the armies and waited at the entrance, emperumAn went around him and placed the chariot beyond his reach, stopping him from being able to fight; bhIshma can aim for distant target, and arjuna’s arrow will fall short; hence when bhIshma takes aim, emperumAn will drive the chariot too far away from his sight and when arjuna takes him, he will drive the chariot to be too close to bhIshma; this ability of driving the chariot makes AzhwAr praise emperumAn as “chiththirath thEr valavA“. thiruchchakkaraththAy – Oh one who is having the weapon which can transform day into night [as done while killing jayadhradha]! eththanai Or ugamum avaiyAy – being the controller of yugas such as krutha etc. avaRRuL iyalum – residing within the time frame of the yugas. oththa … – Being equal in one aspect, and at the same time being different in another aspect, having distinguished, many types of objects – having many such objects as your prakAra (form). Being equal by the species such as dhEva, manushya et al, but being different due to being individual entities. While all AthmAs will be equal due to being embodiment of knowledge, due to the individual identity, they will all be separate/different from one another. viththagaththAy niRRi nI – You remain causing amazement for everyone. ivai enna vidamangaLE – What kind of togetherness of unrelated objects is this! This entry was posted in thiruvAimozhi, thiruvAimozhi 7th centum on October 21, 2018 by Sarathy Thothathri.